Little J & Big Cuz (Series 1) was well received after its screening on both the ABC and NITV in 2017/18. The series has received a number of awards including the 2018 TV Week Logie Award for Most Outstanding Children’s Television Series, along with the 2017 SAE ATOM Award for Best Children’s Television Series, and the inaugural Screen Diversity and Inclusion Network (SDIN) award, created to honour Australian producers and projects which have made a significant contribution to diversity and inclusion, on and off screen. The series was also a finalist in the categories of Best Educational App or e-book, Best Educational Game, and Best Indigenous website at the 2017 SAE ATOM awards. In addition to this success, the series was acquired by USA broadcaster First Nations Experience (FNX) and, in October 2017, the series was screened as part of the Chicago International Children’s Film Festival. Haven’t seen series 1 yet? Well, you can still watch it online by visiting the NITV on demand website or buy the DVD. Series 2 is now in development with the original partners all returning to continue the adventures of Little J, Big Cuz and all their friends. The second series is being produced by Ned Lander, with partners NITV, ABC, Screen Australia, Film Victoria, Screen Tasmania, ACER and the Australian Children’s Television Foundation. The TV show is a fun, animated series constructed as a narrative. The educational foundations are implicit rather than explicit – school is simply a part of life. 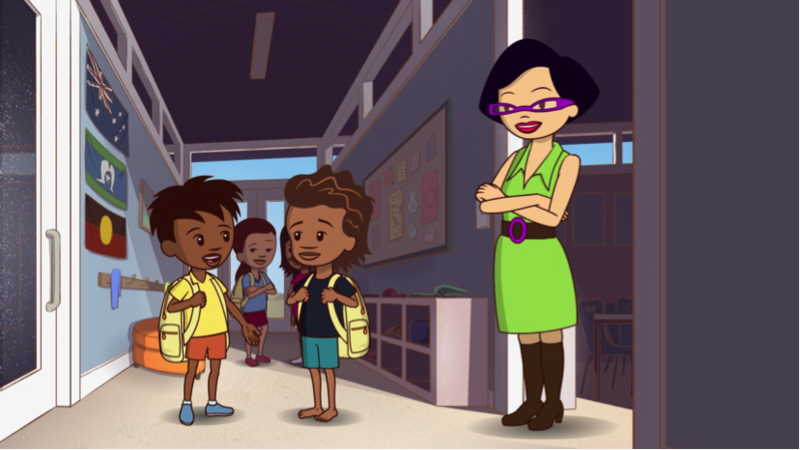 Episodes depict school life and include activities that occur in this space, such as show-and-tell, lunchtime, school performances and so on. Children viewing the show will follow lead character, Little J, on his adventures as he comes to understand and enjoy the sometimes unfamiliar environment that can be school, and the greater world around him. The first series was re-voiced and screened in Pitjantjara, Arrernte, Palaw kani, Yawuru and Walmajarri. The language episodes should be available soon from the NITV on Demand website. In addition, ACER has produced an innovative range of free online educator resources and games. The resources integrate with the series around episode themes and stories, and can be used by educators in and outside of the classroom. These resources have been tailored to work within preschools and schools and have a foundation in the Early Years Learning Framework and the National Curriculum. You can access these by visiting the Little J & Big Cuz website. Being school ready includes the development of foundational literacy and numeracy skills, engagement in learning, and positive attitudes towards education and school. Of equal importance for students and their families is an understanding of how school works, what is expected of them and what they should expect from school. The initiative is not just focused on the child being ready for school, but the school also being ready for the child. 'Ready schools' value the skills that Indigenous children bring, they acknowledge families as the first teachers and recognise the role that families and communities play in supporting lifelong development. The Dusseldorp Forum has funded the final evaluation reports, which evaluate the impact of the initiative on children, communities and schools. There are six case studies, a final report and a literature review available. The feedback and analysis in these reports will assist in developing future series and will help tailor resources for educators and children in order to maximise the overall effectiveness of the initiative. We hope that by providing children with a window into the often-mysterious world of school we can achieve our aim of successful school transition for Indigenous preschool children, a transition that prepares them for a thrilling, lifelong learning journey. With the second series now in development ACER is still looking for partners to support the development of resources for educators and outreach materials for families and communities. Please contact Lisa Norris to express your interest +61 3 9277 5520. ACER is still looking for partners to support the development of resources for educators and outreach materials for families and communities. Please contact Lisa Norris to express your interest +61 3 9277 5520. For more information, see ACER's Indigenous Education Update.